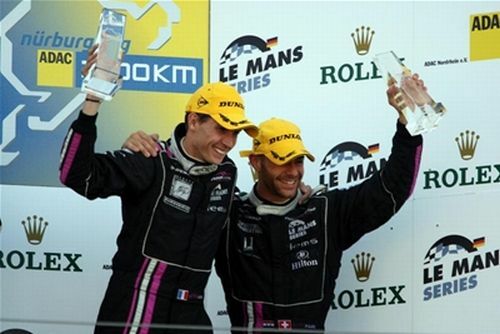 Karim Ajlani scored his second podium of the 2009 Le Mans Series campaign after a determined display at the Nurburgring on Sunday. Team mate Matthieu Lahaye started sixth in LMP2 at the wheel of the #35 OAK Racing Pescarolo-Mazda but was up to third by the end of his opening stint. Karim then maintained that position for the first half of his before a technical problem midway through caused the car’s pace to drop. Despite the electrical fault, Karim was able to retain his third position before pitting. Those half dozen minutes dropped did however relegate the duo down the order to seventh. Over the remaining four hours they would battle back into podium contention, taking advantage of their durable Dunlop rubber by not changing tyres at every stop. With no further problems, Karim had the honour of taking the chequered flag in third after sustaining his co-driver’s pace over a final double stint of his own. “It is great to achieve such a good result. We are all so happy as we had high hopes for this race,” Karim added. “Matthieu knew the circuit well, although I’ve only driven here once, back in 2005. Matthieu did a super job while I also worked hard so naturally we are delighted. We are certainly going to enjoy the result which gives us a massive boost for Silverstone. Team mate’s Richard Hein and Jacques Nicolet completed an excellent day for the Magny-Cours-based squad with fourth. Karim will return to action on September 13 for the final round of this season’s Le Mans Series at Silverstone. Aston Martin Racing: the Lord of the Ring!